PA State Rep. Todd Stephens - See a Pothole? Let Me Know. See a Pothole? Let Me Know. Over the past several months of this difficult winter, our state roads have certainly taken a beating. The result, of course, is potholes-- more than many of us can remember. 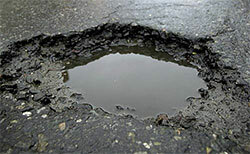 Potholes present a danger to drivers, motorcyclists and bicycle riders. That’s why I am asking for your help to identify problem areas in our community. If you see a pothole on a state road that you believe is dangerous, please report it to my office directly by providing the information below. I will then pass this information on to PennDOT so they can schedule a repair. Contacting me will also help me to track and follow-up on these issues.